This CD brings together a series of pieces, mainly by Russian composers, performed at Friday night musical evenings at the St. Petersburg mansion of the tycoon and musical visionary, Mitrofan Petrovitch Belaieff. He had made millions in the lumber trade. Through his love of music—he was by all accounts a gifted amateur viola player—and his contacts, he was able to create a series of evening concerts where he and his friends would indulge their love for the string quartet. He was especially interested in furthering the case for Russian nationalist music. In 1885, he founded a music publishing firm with offices in St. Petersburg and Leipzig, the music publishing centre of Europe. His aim was to further disseminate Russian music. It was through this action that Belaieff’s Friday Concerts soon began to attract some of the composers whom he published. Some, known as the “Belaieff Circle”, became regulars at the concerts, and even composed pieces specifically to be performed at the concerts. Belaieff, as it were, was seen to fill the void left by the breakup of the “Mighty Handful” as the champion of the nation’s music. 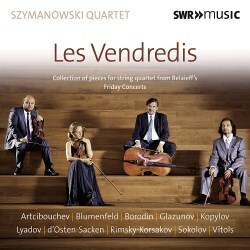 There have been a few other recordings of this wonderful series of pieces, including the very fine version by the Dante Quartet on the late lamented ASV label (CD QS 6229). Whereas the Dantes altered the order of the sequences of pieces, the Szymanowski Quartet present them in the order intended, beginning with the Preludio and Fuga by Glazunov. I feel the Szymanowskis make a stronger case for these pieces from the off. It certainly makes more of a point than the Blumenfeld Sarabande that the Dantes begin with. There is some lovely music here. Yes, some of the pieces can be described as salon music, but others—such as the Scherzo in D Minor by Sokolov—show real mastery of the medium. It was Glazunov’s quartet movements presented here which would ultimately lead me to invest in the wonderful set of his complete string quartets by the Utrecht String Quartet on Dabringhaus und Grimm, although the two pieces do not appear on any of their five CDs of his music. This is a disc that offers the listener enjoyment throughout, whether it be the more salon-like music of Vītols’ Menuet and Lyadov’s Mazurka, or the more important works such as those by Borodin, whose Scherzo is probably the best known piece here—it was used in the second movement of his unfinished Third Symphony—and by Rimsky-Korsakov. There are pieces that would prove to be ideal as short and enjoyable encores during string quartet concerts, whilst the longer works could easily be incorporated into the body of a concert. The Szymanowski Quartet give a performance that is more detailed and a little slower than the Dantes. This also gives some of the pieces a little more gravitas, and the recording is cleaner and brighter. The ASV recording sounds a little old-fashioned and a bit too warm. Where this new recording is a real winner is in the booklet essay. It is detailed and much appreciated, especially when it comes to the lesser-known composers. This is a series of pieces guaranteed to lift your spirits, and a recording to match.